The Star Wars saga is one of the most, if not the most, treasured movie franchises of the last millennia. With a mixture of comedy, romance, action, and adventure, the films are benchmarks of modern pop culture. With each new film comes a burst of re-ignited admiration and excitement for the franchise. The most recent film released was Star Wars: Rogue One. The film takes place between Episode III: Revenge of the Sith and Episode IV: A New Hope. The new film is the story of how the plans of the Death Star (the space station that was included in the first movies during the late 1970’s and early 1980’s) were acquired by the Rebel Alliance. However, the movie is not directly involved in the main storyline. It follows the young rebel Jyn Erso, the daughter of the Empire’s unwilling lead designer Galen Erso. She teams up with the Rebel Alliance to retrieve the Death Star plans so that they can destroy the space station. The movie definitely had some upsides to it. For one, the acting was spectacular. Felicity Jones (Jyn Erso) and Diego Luna (Cassian Andor) delivered two great performances as the two main characters of the film. 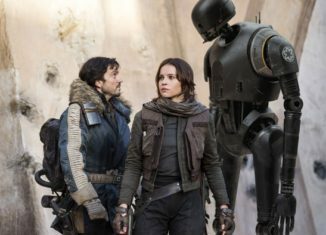 Their sidekick, a re-programmed imperial droid named K-2SO (voiced by Alan Tudyk), provided a comedic relief that was well-written and had a great overall effect on the film. The visual effects were also great, and gave the audience that classic ‘Star Wars’ feel that they so desperately crave. One of the best examples of how great the visual effects were was the revival of Grand Moff Tarkin. Played by Peter Cushing in the original film, Grand Moff Tarkin was brought back using special effects to be in this newest film, released almost 40 years later. However, as Cushing died in 1994, an actor had to be used to play him through special effects. Guy Henry was chosen to play Tarkin and did a spectacular job mimicking his vocal style and body language, while Cushing’s face was superimposed through modern technology. The final battle was one of epic proportions. Not only were the visual effects great, but the multiple small actions that had to take place in order for the plans to be acquired were well executed by the actors and provided a smooth transition to the beginning of Episode IV: A New Hope. However, every movie has it’s down sides, and this movie certainly has some. Up until the final battle, the film was a little boring. There was not enough action to begin with as it primarily focused on identifying the conflict as well as giving background information to some characters. Chirrut Imwe (Donnie Yen) and Baze Malbus (Jiang Wen), even though they were very interesting characters, provided very little to nothing at all for the plot of the film. They helped Jyn and Cassian but did not have any real purpose besides that. The main antagonist, Orson Krennick (Ben Mendelsohn), was not, in my opinion, a good enough antagonist for the film. Sure, there was some backstory between him and the Erso family as he killed Jyn’s mother, but he acted like a puppet behind Grand Moff Tarkin. Overall, the movie was pretty good. It had some flaws here and there as nearly every movie does, but the positives outweigh them. The movie delivered an in depth look at some more Star Wars history. Although some people could view the film as unnecessary, it was very fun to watch. I recommend that all Star Wars fans see it as it provides more history to one of the most famous movie sagas of all time.